Yippee! Posting the blog worked! Onward! I feel resuscitated…. not from mouth to mouth, but as though I’ve received a couple of good pushes to the diaphragm. I can breathe! Next I’ll learn how to post photos and new notes on the side-bar. I need also to learn how to market my memoir of the Great Peace March in which no fewer than 400 of us walked from Los Angeles via Manhattan to Washington, DC in 1986. People who have read it report that they couldn’t put it down, that they are inspired to see our country, maybe not from on foot, but with closer attention to our history and our people. They say that although they won’t be walking 3,700 miles for Global Nuclear Disarmament, they will join in that cause right at home. These comments encourage me to promote Walking for Our Lives. I wish I knew how. It’s on Amazon. Several times a week I send signed copies to those who order. I enjoy the book talks I give for book clubs, women’s clubs, Rotary clubs, AAUW, church groups, and those audiences buy. But that’s not enough. I sent in inquiry to Robert Redford, hoping he’d make a movie of it, but the reply said they “for legal reasons cannot accept unsolicited material.” What does THAT mean? Here I am, having celebrated my 86th birthday in September, needing to learn so much! Any ideas? I’m on a roll here, gathering momentum, as I post for the second time in my life, the blog! If you regularly follow my blog (or me! ), you know that I offer writing workshops each quarter to those interested in starting their own memoir. Hopefully, you’ve picked up on some tools and strategies from my blog posts, but for those who need an extra push or want to begin creating their memoir among like-minded individuals, I welcome you to attend my next workshop on September 15th from 10am-2pm in my home in Capitola, CA. To RSVP or simply to get more details, please email me at lovedonna@sbcglobal.net. The cost is $40, which also includes a light lunch. Don’t you love it when dreams come true! One of mine did a couple weeks ago when I spoke at Bookshop Santa Cruz, our local (successful!) independent book store. I had wanted to speak there since last fall,when I spoke at Capitola Book Café. Many friends came to that presentation, just after Walking for our Lives was released in September and the book club members had occupied the entire front row. I had wandered among the gathering, happily greeting friends as I would have for a party in my home. They listened attentively, faces bright, nodding occasionally, and clapping enthusiastically. Five years ago this month I was gathering short stories to compile for Tell Me a Story, my first memoir, which was intended to be a Christmas gift to members of my families. Now it’s for sale on Amazon! I was fortunate to be interviewed several weeks ago by Michael Hemp in Monterey, California, for Wave Street Studios’ authors series. For an hour we discussed my three books, written since reaching the age of 80, and my life as a member of the Great Peace March for Global Nuclear Disarmament. 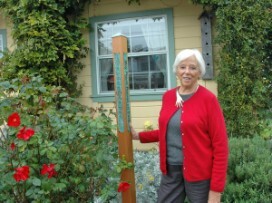 Last Friday Cheri O’Neil, a freelance writer for Capitola Patch met with me to discuss Walking for our Lives, spreading peace and my memoir writing workshops. I very much enjoyed chatting on and on all about me! It was fun to be heard. 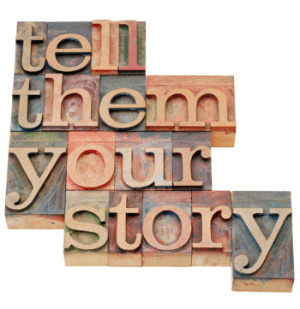 Rather like the sense we get from writing our memoirs: we are heard! I have good news! My granddaughter Sarah, recent Northwestern University graduate and professional PR and blog master, has become my new Publicist. What a relief to know that she, who knows what she is doing, will be responsible for marketing my first two books, TELL ME A STORY and TO MAKE THE HOUSE COMPLETE, and any others to come, as well as the quarterly memoir writing workshops. My newest project is a book about the Great Peace March for Global Nuclear Disarmament, a 1986 walk across the United States from one coast to other. The book follows the journey of a divorced San Francisco Peninsula housewife (me!) from her life of comfortable conformity to being comfortable with herself. It is a hero’s journey, complete with companions, obstacles, guides, miracles, and opportunities. And as I have been writing about this long walk and my experiences on the road, I realized that this walk transformed my opinions on what is important and what is worth fighting for. The book is about a walk, but the stories within it are of my own transformation. The writing, too, is a journey. As we have discussed in my memoir workshops, writing is healing. When we look at a situation – whether a difficult or rewarding one – from a writer’s perspective, we understand more deeply what happened and why. We are able to understand the motivations of our adversaries and foibles of our heroes. The playing field is leveled, and we take another step toward peace and equality among us. In future posts, I’ll comment more on the experience of writing a memoir, as well as the experience of writing my memoir. It is a unique and intimate form of story because unlike the writing process of a novel, you don’t have to start at the beginning. My stories weave in and out of moments, reflecting forward and backward, creating a narrative of experiences that is anything but linear.